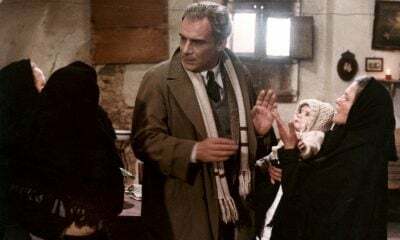 Adapting a novel that thinly fictionalized the brazen 1963 killing of Greek opposition leader Gregoris Lambrakis in front of throngs of witnesses and passive police, Costa-Gavras begins the film with an anti-disclaimer that proclaims its intentional resemblance to reality. (“Greece” is not spoken until the final voiceover; events are often given their historical dates but the main characters no proper names, lending a Kafkaesque, abstract undercurrent to the scenario.) Yves Montand plays the Lambrakis figure, “the doctor,” a principled, charismatic anti-NATO leftist who arrives in a major city to find that conservative officials have maneuvered to deny him a venue to deliver a plea for peace; low-key but determined, he and his coterie improvise new arrangements, but he is the target of a drive-by clubbing in the street immediately after his speech. While the victim lies dying, his associates argue the merits of seeking justice or revenge, and the military police and Royal Court conspire to cover up the death as a drunk-driving accident. Of the triumvirate of stars in the cast, only Montand makes a lingering impression as the pacifistic martyr; as his grieving, semi-estranged wife, Irene Papas could have been billed as Special Guest Mourner, weeping and sniffing her departed husband’s aftershave lotion. When the film’s second hour shifts to the pursuit of the truth by a straitlaced but zealously fair-minded magistrate, Jean-Louis Trintignant hides behind his glasses, ostentatiously striving for dullness. But Z isn’t a star-driven affair; camera relentlessly in motion, it chugs along efficiently, with Trintignant’s judge almost accidentally uncovering evidence of official complicity in the bloody plot. Two action set pieces, one with a Montand colleague flinging himself onto the assassin’s vehicle after the assault, another where a car speedily pursues an opposition lawyer on sidewalks and through a park, supply the juice, along with a versatile synthesized/trad-folk score compiled from the work of Mikis Theodorakis, a political prisoner in Greece at the time. Raoul Coutard’s cinematography, digitally transferred under his supervision, is likely the crown jewel of this package. Often awash in bright outdoor or artificial light to suggest that the Greek neo-fascists can get away with murder in plain, sunny view, it shines with ’60s modernity and restored sharpness. The remastered mono sound is clear. Criterion supplies brief archival TV sessions with the filmmaker, principal actors, and Vassili Vassilikos, author of the source novel, who confirms that the police in his native city of Thessaloniki (site of the assassination dramatized in the film) used local merchants, dependent on them for permits and ability to make a living, as secret enforcers. In new interviews, Costa-Gavras describes his dual self-image as “a kind of activist” and an entertainer who is “doing a show,” staccato editing and short scenes as the best means of stirring the audience’s feelings, and the use of Algiers as the production’s primary location; director of photography Raoul Coutard recounts the lengthy night shooting with crowds of extras, and contrasts his more improvisational work for Godard with Costa-Gavras’s structured approach. Peter Cowie’s commentary track focuses on placing the film in the context of the global turbulence in the late ’60s, its timely emergence after the Greek rightists seized power in 1967, and the influence of earlier political film traditions on Z. Rounding out the set is a theatrical trailer and critic Armond White’s essay praising the film’s “noirish parameters” and the way it “recalls the righteousness of late-forties Hollywood political thrillers.” The most glaring omission is footage or other material specifically concerning Gregoris Lambrakis and his movement. This edition of Z lives, perhaps ironically, through the beauty of its surface and sheen.